The questions that naturally are these: what took India so long? Why did the Indian policymakers not do all these things, say, 50 years earlier? These are very important questions and they are worth addressing. There are a number of factors which delayed the India Miracle. First was the colonial hangover. India was a British colony for nearly one hundred years. As mentioned previously, the government objective did not change with political independence. Note the qualifier “political.” India’s independence gave people a degree of political freedom but they still did not have economic freedom or complete personal freedom. Furthermore, post 1947, India’s leadership was seriously misguided and took the wrong turn into socialist thinking. The people who got control over India were people who were good at one thing mainly: to take over power from the British. For the most part they were not accomplished in the kinds of areas that are critical for nation building. They were politicians who were good at getting crowds worked up but did not know how to get the crowds to work coherently towards building a nation. Nation building takes a different skill set, which in their case they did not have. What’s worse, these politicians did not even know that they lacked the necessary expertise. Some were motivated by good intentions, no doubt. But that is not sufficient, especially when the task at hand was so complex since India was a large country. Poor leadership explains quite a bit of why India did not really prosper immediately after independence. They made poor choices which hindered India’s progress. Around the same time, other nations were rapidly developing. All that the Indian leaders had to do was to see how others were progressing on their development agenda and learn from them. This they refused to do. Hubris and ignorance among the powerful is a potently destructive mix and a sure recipe for disaster. What’s really sad is that these Indian leaders closed India off to foreign trade. India’s autarkic regime (a regime not open to foreign trade) was in sharp contrast to the open economies of the East such as Taiwan, South Korea, and Singapore. The people of India did not understand the mistakes that their leadership was making because the people were largely illiterate and generally uninformed. The people had immense faith in their political leaders and the leaders basked in that faith. The people generally assumed that the government was benevolent and in charge of their welfare. The relationship between the government and the people was that of the ruler and the ruled. The government treated the citizens as if they were irresponsible, immature children who needed to be told what to do and when to do it. In turn, the citizens expected handouts from the government. To get the most from the government, groups based on religion and caste competed with each other for entitlements. That relationship was mediated by the only coin of the realm of democracy: votes. Depending on how large and vocal a voting group was, the government gave it importance. The power of a voting group was directly related to how unified it was in voting, and how diligently they exercised their franchise. The most unified voting group got the most entitlements from the government. The government was all powerful but it was a parasite. It did not produce wealth; it merely consumed part of taxes it collected, spent some on public goods, and redistributed some bits. It also borrowed heavily and went into massive debt that had to be eventually repaid by the taxpayers. Part of the taxes the government collected was distributed to various religious and caste groups based on the calculus of what it expected at the voting booth. The tragedy that followed this scheme is easy to understand. As the old saying goes, the government that robs Peter to pay Paul will always have the support of Paul. So if there are more Pauls and few Peters in the economy, the re-distributive government will always be favored at elections. In general, the government does have a re-distribute role in an economy to help ease any major inequalities. But if all that the government does is redistribution and neglects to help the creation of wealth, then with time people would figure out that working is not all that rewarding since the government takes a major part of the income anyway to give to people who don’t work. The incentive is then to spend more effort in getting things from the government and less time actually working to create wealth. Not everyone depends on government handouts, of course. The middle class does the heavy lifting. It is also the middle class in any economy which is the prime driver of change and growth. It’s the middle class because the really wealthy are doing quite well as things stand and therefore have little incentive to bring about change since they cannot be sure that after the change they will be actually better off than before. They therefore sensibly choose not to mess with a good thing. At the other end of the wealth spectrum, the poor would definitely like change but are too busy scratching out a living to be able to bring about the change that would be good for them in the long run. The struggle for existence puts a premium on short-term thinking. It is the middle-class that has the education and the means to bring about change. They are squeezed the most and they feel the pressure of a dysfunctional government most acutely. Positive change is often effected by an educated middle-class that is able and willing to step out and make a difference. India had a very small middle class till near the end of the last century. It was too small to make a difference at the voting booth. Knowing that their numbers did not stack up very well, they kept away from voting. That was a type of self-disenfranchisement, and a self-fulfilling expectation. Their votes did not matter because they did not vote; and they did not vote because their votes did not matter. With time, however, two demographic changes occurred. First, the middle-class grew as a percentage of the total population. Second, the middle-class became more educated. But that was not all. There was one more fortuitous development in the world: the dawning of the Age of the Internet. The middle class grows in any growing economy. During the early decades following India’s independence, the middle class grew slowly because the economy was growing very slowly. Then near the end of the last century, the middle class started growing at a reasonable pace because the economy was growing. This was mainly due to the limited liberalization of the economy that India was forced into around 1991. This led to a positive feedback cycle. The growth of the middle class helped the economy grow faster, and that faster growth itself helped the middle class grow even more. However, just the growth of the middle class was not enough. The middle class was large but was not conscious of its own strength. It was not aware that it had the power to bring about change. It did have a strong feeling that things were not going as well as they should. It knew that things were going from bad to worse in many respects but did not know that it alone had to act to fix things, and that it alone had the capacity to solve the problems of the country. The knowledge of what to do and how to go about doing it was missing. That’s where the internet and the world wide web enter the picture. The information and communications technologies (ICT) revolution was well under way in the start of this century. Instead of passive consumers of whatever information that the government deigned to give to the citizens, the middle class was now empowered to learn about the world and about their power to effect change. In the past, information was controlled by the government. India had a degree of freedom of the press – but only in print and television but not on radio. Furthermore, with widespread illiteracy, a free press does not have much meaning. Besides, the government spent huge sums for advertising in newspapers. That was a very handy lever for the government to control the newspapers. Media could not afford to get on the wrong side of the government for fear that it would hurt them financially and make their lives uncomfortable. The mainstream media — the radio, TV channels, and newspapers – was therefore either directly or indirectly controlled by the government. The people largely heard or read what the government wanted. The people were told that they had freedom of press. Education, as we noted previously, was government controlled and therefore what people learned at schools and colleges was what the government wanted the citizens to know. Since what you know determines how you act, the citizens were trapped into a mental prison that was as invisible as it was pervasive. The internet changed all that. Information became free of the channels that the government controlled. Moreover, the cost of creating, storing, retrieving, transmitting and sharing information dropped precipitously in the early part of this century. Everyone had nearly all the information they needed at their fingertips. All that was needed was a way of transforming the information into knowledge, and then using that knowledge to propel action. The internet gave birth to the new leaders and empowered them to help the citizens bring about the change that we see around us today. People got control of information and that shifted the balance of power away from the government and in the hands of the people where it rightfully belonged. Every age has its own leaders. The nature of the leaders and the source of their power are molded by the age. In the agricultural age, leaders had control over land. In the industrial age, the heads of vast industries had the power to shape the destinies of countries. In the post-industrial age, leaders had an understanding of information and communications technologies. India’s new leaders in the first quarter of this century were children of the post-industrial information technology age. They understood the transformative power of information, and knew how information properly conveyed can change what people know and thus affect behavior. The India Miracle is the most impressive example of a massive economic revolution made possible by the ICT revolution. It is important for us to note how ICT was a very critical enabling tool in the India Miracle. First, it was instrumental in a massive public education campaign. Purposeful action is always a function of what we know. When presented with new information, especially the kind that makes people realize the importance of action, people are motivated to make a difference. You may be quite content to spend the afternoon at the park until a neighbor calls to say that your house is on fire. That new information gives you a reason to act. The government had persuaded the middle class — through the complicit and compliant media — that India was not doing too badly. There had been improvements in the standard of living of some people following that bit of economic liberalization of 1991. The people did not know that it was really marginal compared to what was actually possible. On top of that, people did not know why it was that India had stagnated for so long. They had always known that India was a poor country and accepted it as an unalterable fact of nature like the seasons, and that was that. Public awareness and education changed all that. People understood that India’s poverty and general lack of economic growth and development were the consequence of poor public choices that their esteemed leaders had made. They began to understand that there was a way out of the deep hole that India was stuck in. A new leadership arose which was able to send out the call that India was ready to do what it takes to make India a developed country. The call to action was made and like in the case of a house on fire, people were moved to act immediately. 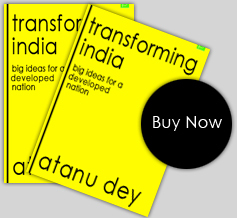 The process that gave India new leaders began slowly around 2010 but gained momentum rapidly. By 2012, what began as a small group of around a dozen dedicated people grew to thousands of people with a variety of skills and from diverse backgrounds across India. The group was called “Indians for Comprehensive Freedom” or ICF. They mobilized the middle class. ICF was an advocacy group. Its objective was political change but it was not a political party itself. They deliberately chose to not be a political party. Political parties take a long time to grow. The major political parties had sufficient “market shares” that start-up political parties did not have any chance of making a significant difference. What ICF did was to work within the system to force change in the existing major parties. Let’s remember that there is a link between the elected politicians and the performance of an economy. People elect politicians. Politicians dictate policies. Policies matter in determining the success or failure of any economy. Indians — even the educated urban people — did not fully appreciate that connection. They voted without fully understanding that what India needed most was good policies, and therefore it was up to them to elect good politicians. The first challenge the ICF group undertook was to make the people aware of the truth. They put together the most relevant information for a great public education campaign, and used all available channels to broadcast the content. Remember that the mainstream media was at that time controlled, although indirectly, by the government. But by 2010 India had a very robust mobile phone system, and the internet was making its presence felt. Thanks to that, ICF was able to circumvent the barrier that the mainstream media posed. Not just the internet, the entire range of communications media was available for the distribution of text, audio and video: books, pamphlets, CDs, DVDs. The information that the government had managed to suppress for many decades was finally set free and the people understood the reality like never before. Because of the public education campaign, people became more informed and appropriately modified their behavior. The most significant change was at elections, and that gave meaning to the claim that India was the largest democracy. Democracy is not just about voting but rather it is informed voting. Indians finally knew what and whom they were voting for and why. We must note that it was not as if 100 percent of the population changed their minds. That is not only not possible but also not necessary to bring about change. The aim of the ICF group was to get on board the urban population, and this they did effectively. By 2014, they had signed up about 10 percent of the urban population, or around 30 million people. That number was sufficient to swing elections. In the general elections of 2014, ICF helped around 50 honest, competent, committed people become members of parliament, the Lok Sabha. With a little help from others, this new breed of MPs started the India Miracle. The economy got liberalized to such an extent that the government was no longer in the business of business. That reduced the incentive for criminals to enter politics since being in the government no longer afforded the opportunity to make huge fortunes. The de-criminalization of politics was the most important side-effect of the liberalization of the economy. That was to be expected. It was a virtuous cycle arising out of a positive feedback loop: as power shifted away from government, fewer criminals entered politics, and that created the space for good people to enter, which led to more liberalization of the economy, and so on. The 2019 elections saw the numbers of good MPs increase to 300. You have to understand how radical this was. Before 2010, around half of the MPs had criminal backgrounds. The 2019 elections reduced the numbers of criminals in parliament to about 10 percent and by 2024, the parliament was totally de-criminalized. You may wonder about the speed with which the change occurred. It took only two general election cycles for the replacement of criminals with real leaders. Yet the situation looked rather hopeless around 2010. There’s really nothing surprising that India is a great nation today. In a sense you can say that it was taken ill temporarily, but its DNA did not change. Its dismal economic performance in the 20th century relative to the rest of the world was just an aberration. It was a slumbering giant and when it awakened, it moved with surprising speed. When you know where you are headed and why, and have a good road map, only then can you move confidently and fast. India developed rapidly because the compass which guided India’s progress was simple, and because of its simplicity and accuracy. Those were called the “Pretty Good Principles.” They called for a limited government, and a just society based on equity, fairness and equal treatment of all citizens. The Indian government had not been based on those kinds of principles, the foundation upon which development rests. Indians had not seen good governance for so long that they had convinced themselves that such a thing did not exist. Human behavior is broadly predictable. If we believe something is impossible to get – however immensely desirable it may be – we simply don’t even ask for it. We are risk averse and especially don’t want to risk disappointment. But if we see a good thing demonstrated, we immediately understand that it is possible, and so we demand it and eventually get it. Luckily, by 2010 a couple of states of India had had reasonably good governance (going by the standards of the day.) That expanded the possibility frontier and people were ready to demand good governance. And ICF was ready to show the people how to go about getting good governments at every level. What ICF did was create a voluntary association of urban voters, called “United Voters of India” or UVI. Their motto was “Good Governance Through Participation.” People who joined UVI understood the need for the government to concentrate on those areas which only a government is capable of – such as national defense, law and order, central banking – and not be in areas which a competitive private sector can serve efficiently such as telecommunications, transportation, energy, education, and so on. In other words, they agreed that society should be based on something like the Pretty Good Principles mentioned before. UVI became an urban “vote bank” with the specific objective of forcing political parties to put up competent candidates and therefore reform governance. To become a member of UVI, you had to take a solemn oath to vote in all elections, and to vote for the candidate or the party that the association had selected. The selection was done through elections internal to the local UVI chapter. UVI helped bring about the India Miracle. It was an idea whose time had come. Primarily and in the ultimate analysis, it is all about ideas. Economic advancement itself is a consequence of a set of good ideas that work in harmony to produce what’s desirable. Let’s talk about ideas for a bit. Everything that you see around you started off as an idea in someone’s mind. Take everything that you see around yourself, all the stuff you use, from food to houses to electronics to clothes, ad infinitum. None of them existed just a few thousand years ago. The raw materials existed but it took human labor, energy and technology to create all the stuff we use out of it. Technology is itself “embodied ideas.” Every bit of technology is the result of ideas painstakingly discovered by brilliant people. People combine previous ideas to create new ideas. Ideas, through technology, help us transform the world by providing us with all the material goods we use. But ideas differ from material goods in an important sense. Ideas are what economists call “public goods,” as opposed to “private goods” which are things that you can grab with hands. Private goods are “rival in consumption,” meaning if you consume it, the total stock goes down. If you eat an apple, or trade an apple for something else, your stock of apples goes down. Ideas are public goods and when used, the stock of ideas does not go down. The stock of ideas keeps growing. If you have an idea and I have an idea, we can share the ideas and both of us have two ideas. The stocks of both ideas and material goods have been increasing in the world. The thing is that once a good idea is created, it persists and is available for anyone to adopt and use it. India was running behind in the race to become developed. Being late is never a good thing but if one is smart enough, one has the possibility of catching up quickly by taking advantage of the ideas that have already been discovered and used by others. Among other things, being late on the scene allows one to learn from others’ experiences and avoid the mistakes they had made. It allows the late comers to “leapfrog” certain intermediate steps. An example of such a leap-frog move is India’s telecom story. Developed countries went through the stage of having an extensive and expensive copper-wire telecom infrastructure. India leapfrogged nearly all of the copper wire telephony stage and went directly to a wireless communications system. There are many other areas where India leapfrogged. Instead of going through the stage of “everyone having a personal car,” it went directly to having good public transportation in all its new cities. Indeed, it went directly to building modern efficient 21st century smart cities instead of going through the intermediate state of building 20th century dumb cities and then upgrading. Over the 20th century, good policy ideas were discovered at considerable expense by those countries that were pioneers of development. India had the benefit of those ideas. In other words, it not only did not have to re-invent the wheel, but had available the state of the art technology in wheel-making. It did not matter where an idea originated; what mattered is that it was right for the job. As we noted earlier, the revolution in ICT made the free flow of information possible. That is another way of saying that ideas were available for India to adopt. Fortunately, after 2014, India got good leaders who understood the power of ideas. That is why India could make squeeze within one generation the kind of progress some economies which had gone before had taken a hundred years to achieve. Now that India is a developed country, it is now leading the pack in adding to the stock of human knowledge and ideas. At one time, India’s great burden was its immense population. People need material goods to survive. But since even those who don’t produce still have to consume, India’s poverty was a consequence of too many people and not enough production. When India finally got the education system that it needed, its population became net producers — and that transformed India’s great burden of unproductive people into its greatest asset since educated people are the ultimate resource. Educated people are the greatest natural resource that any country has. You are the beneficiaries of our amazing education system. What you are capable of giving back to society is unparalleled in human history since you are more educated than any previous generation. For many of you, your formal studies have come to an end. But for all of you, life is one continuous learning-by-doing. So keep learning lessons and doing what needs to be done. Remember that your parents worked hard at making India what it is today. You owe it to them and to your children that you work hard at making what you have been given even better. Be well, do good work and good luck.